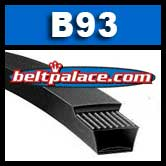 B93 Classical V-BELT. Bando Industrial. B93 Classical V-BELT. Bando Industrial. 21/32" x 96" Outside Length.